Last week saw the release of the IEAs 2009 World Economic Outlook on which we will be providing some analysis in the coming weeks. The night before its release, the Guardian ran an interview with a 'whistleblower' claiming that key oil figures were distorted by US pressure so as to avoid 'panic buying', claims the IEA subsequently denied. Today, we see the fourth Guardian article in a week on the urgency of Peak Oil. Colin Campbell, one of the worlds preeminent depletion analysts, and co-author of the 1998 Scientific American article, "The End of Cheap Oil", drafted a reply to the Guardian on these issues. Below the fold is Dr. Campbell's letter, which gives some relevant history as to how the oil depletion debate has unfolded over time in the worlds energy agencies. I was most impressed that you should give such prominence in your issue of 10th November to the role of the International Energy Agency in assessing the status of oil depletion. It is one of the most important issues facing the modern world, given the current dependence on cheap oil-based energy. I can provide you with some more information on the topic, touching on my own experience. I first became aware of the issue in 1969 in Chicago when I was part of a team making a world evaluation for Amoco (now part of BP). Later when I was managing Fina in Norway, I had the company sponsor a research project on the subject with the Norwegian authorities. We used public reserve data, as I had not then appreciated how unreliable they were. 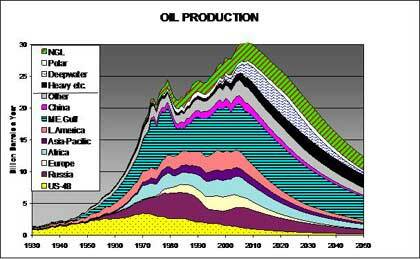 The results were published as The Golden Century of Oil 1950-2050 (Kluwer Academic). This attracted the interest of Petroconsultants, a company based in Geneva that was used by the international oil companies to assemble a valid database on oil activities around the world including the size of discoveries and drilling statistics. They invited me to redo the study but this time using their comprehensive database of virtually all the world’s fields. I was joined in this project by Jean Laherrère, formerly Exploration Manager of the French oil company TOTAL, who had developed various analytical techniques. The resulting study was published at $50 000 a copy, but was later suppressed under pressure from a major US oil company, which had better remain nameless. However, Petroconsultants co-published a book, The Coming Oil Crisis (Multi-Science), which I wrote summarising the results, and also agreed that Laherrère and I should accept an invitation to write an article for the Scientific American : The End of Cheap Oil (March 1998). The IEA purchased this book and contacted me, sending an analyst to spend a week going through the data. It was evident that the team within the IEA working on the subject was fully convinced and saw its importance. They then produced a report for the G8 Ministers, meeting in Moscow (International Energy Agency, 1998, World Energy Prospects to 2020; Report to G8 Energy Ministers, March 31 www.iea.org/g8/world/oilsup.htm). The text was bland enough but it contained a critical table showing that oil demand would outpace supply by 2010, save for the entry of an item called Unidentified Unconventional, whose supply was shown to meet as much as 20% of the world’s needs by 2020. Having managed to get it past the G8 Ministers, the IEA team was able to include it in the World Energy Outlook for 1998. In effect, the Unidentified Unconventional was a coded message for shortage. I explained this to a journalist who contacted the element within the IEA which was pleased that this important hidden message should get out. But when it was published (Fleming D., 1999, The next oil shock? Prospect April), the IEA evidently got into serious trouble with its masters in the OECD governments, and in the next issue of the World Energy Outlook, the Unidentified Unconventional became Conventional Non-OPEC, without comment or explanation. The primary function of the IEA was to supervise OECD strategic stocks, which in turn were perceived to be a certain defence against any excessive demands by OPEC. So the IEA came to see its role as protecting consumers’ interests, and it therefore had every reason to downplay any notion of depletion and finite limits imposed by Nature, because indirectly such would strengthen the hand of OPEC. Petroconsultants was subsequently acquired by IHS in the United States, and the special relationship with the international oil companies was lost, affecting the quality of the data. It may also have found itself under pressure from commercial interests and the principal OPEC countries.  It is worth commenting briefly on the reporting of reserves. There is no particular technical difficulty in assessing the size of an oilfield early in its life, although naturally there is a certain range in the estimates. The reporting of the reserves has however been subject to two main distortions. First, the oil companies were subject to strict US Stock Exchange rules designed to prevent fraudulent exaggeration. It made sense therefore for them to report the minimum needed for financial purposes, and then revise the estimates upwards over time, giving a comforting, if misleading, image of steady growth. Second, the OPEC countries found themselves competing for quotas in the 1980s when prices were low. Quota was based on reported reserves, which prompted Kuwait to add 50% overnight in 1985 although nothing particular had changed in the oilfields. It may in fact have started reporting total found, not remaining reserves. 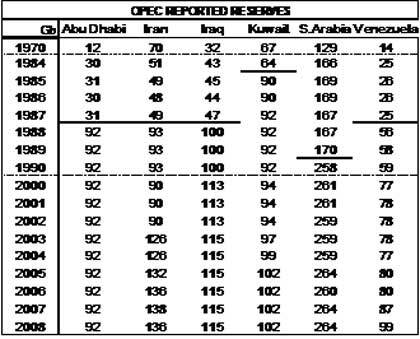 The other OPEC countries later reacted with invalid increases to protect their quota (see table). To imagine that new discovery should exactly match production in Abu Dhabi to leave unchanged reserves is clearly absurd. Despite these difficulties, it is possible to make a reasonable assessment of the situation starting with the sound historical data from Petroconsultants. The following graph shows my current assessment. Briefly, Regular Conventional Oil peaked in 2005. The shortfall was made good by expensive oil mainly from deepwater fields and Canadian tarsands, which led to rising prices. This trend was spotted by shrewd traders who started buying contracts on the Futures Market, while the industry maintained high levels of storage, watching it appreciate in value at no cost or effort. The rising prices also delivered a flood of petrodollars to the Middle East where it still costs on average about $10 to produce a barrel. The surplus was in turn partly returned to Western financial institutions, contributing to their instability. The surge in price reached extreme levels in mid 2008, approaching $150 a barrel, which prompted the shrewd traders to start selling short on the Futures Market and for the industry to start draining their tanks before they lost value. The high prices in parallel triggered an economic recession which dampened demand causing prices to fall back to 2005 levels before edging up to around $75 today. It is more difficult to evaluate the Non-Conventional oils, comprising tarsands and heavy oils, deepwater oil, Polar oil and Natural Gas Liquids, but the above graph suggests that the peak of all categories was passed in 2008. A debate rages as to the precise date of overall peak but rather misses the point when what matters is the vision of long decline on the other side of it. Given the central role of oil in the modern economy, the peak of production promises to be a turning point of historical magnitude. It seems that banks have been lending more than they had on deposit, confident that Tomorrow’s Economic Growth was collateral for Today’s Debt, without recognising that the expansion was fuelled by cheap oil-based energy. The Governments are now printing yet more money under Keynesian principles in the hope of restoring past prosperity, which may meet with a brief success. But if it does, it would stimulate the demand for oil that would again soon breach the supply limits, leading to another price shock and an even worse consequent economic depression. In fact, today 28 billion barrels a year support a world population on 6.7 billion people, but by 2050 the supply will have fallen to a level able to support less than half that number in their present way of life. There is a great deal that can be done to reduce waste and bring in renewable energies. Coal and nuclear power can also ease the transition although they are themselves also subject to depletion. The challenges are however great, and it is clear that governments must move urgently to prepare for what unfolds. In parallel come the challenges of climate change that are to a degree related to oil supply. There may well now be a certain awakening, and the OECD governments may begin to seek an umbrella under which to introduce new national policies. This may in turn allow the IEA to come forward with more realistic assessments of the true situation. The media too has an important role to alert people at large of what unfolds. It underlines the value of the article you have published for which you deserve every credit.